Melissa is a former Magic pro player and strategy writer who is now working in R&D on the Play Design team. Welcome to week one of the new Play Design column. I'm Melissa DeTora, play designer in Magic R&D. I know that most of you are here to see Hour of Devastation preview cards, but before we get to that I'd like to give you a little background about me since many of you have never seen my byline in this space before! I've been playing Magic for 20 years and have played in eighteen Pro Tours. I have a Pro Tour Top 8 to my name as well as two Grand Prix Top 8s. I started working with Wizards in January 2015 and left after a year when my contract ended. I returned six months later, and then was hired as a full-time member of the Play Design team in April 2017. Torment—Each opponent loses 3 life unless that player sacrifices a nonland permanent or discards a card. On the surface this mechanic looks exciting. It offers three negative but interesting choices to your opponent. The problem is that when a mechanic like this is attached to too many cards, the decision becomes less and less interesting. Imagine if most of your creatures had Ravenous Rats's triggered ability attached to them, or had "When this enters the battlefield, target opponent loses 3 life." If this mechanic is on most of the cards in your deck, games begin to play out similarly. Early in the game, when resources are light, your opponent is probably going to choose to lose 3 life. Later in the game, your opponent may be holding extra lands or have some small expendable creatures to throw away. The games begin to play out the same; early in the game they choose life, and late in the game they discard cards or sacrifice creatures that aren't affecting the board. Once those are gone, the opponent will be forced to lose stronger creatures. Overall, it's not very fun to begin each game around 11 life and even less fun to hold on to cards in fear of your opponent tormenting you. If the torment mechanic only shows up occasionally, the decision becomes more interesting, not only for your opponent but also for you. Maybe you hold on to your torment card until your opponent is at a low life total so that they are forced to lose a card. Maybe you wait until they have no cards in hand. Overall, the gameplay becomes more strategic and fun. In the end, the design team decided to cut the mechanic from the set but leave in a vertical cycle of cards with the ability: one at common, one at uncommon, and one at rare. 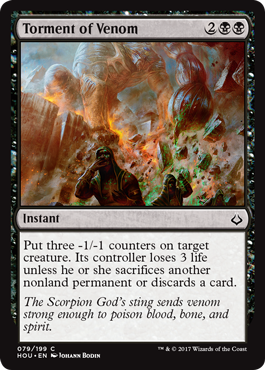 Torment of Venom is one of my favorite commons in the set for Limited because it's so much more than a removal spell. It can be a combat trick, a tempo play, a two-for-one, or get the last card out of your opponent's hand. It's not always obvious when it's correct to cast this. However, this card reads "Kill a creature, the opponent takes 3" the vast majority of the time. This card is intended to be a Limited build-around or a finisher for control decks. It's not very strong in an aggressive deck because it has the classic problem that it doesn't really do anything the turn you cast it. A four-mana investment is a lot to ask for in Limited, and when your opponent is losing life the first turn or two, you may feel like you're not getting anywhere. That four mana could have been used to build up your board in some way. It's hard to evaluate if it's correct to include this in your deck. That said, once this is in play for three or more turns, this effect gets stronger and stronger. Eventually your opponent can't choose to lose life and instead will have to lose one of their other resources. 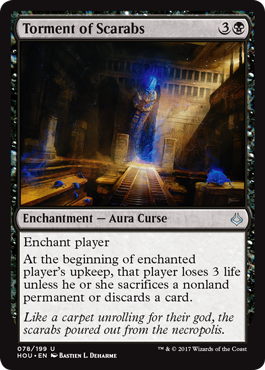 That could mean them choosing to not play out lands or cast spells to satisfy the discard condition, and if they are forced to play out their stuff or if you have something like Unburden, they'll be losing creatures turn after turn. This card is stronger than it looks, and really showcases how powerful the torment mechanic was in design. Not just a Fireball, but better. Each mana you pump into this is 3 damage instead of 1. That's game, right? Not really. Casting this for one or two doesn't do a whole lot, and casting this for four isn't always as powerful as you may think. Your opponent is making all the choices involving this card. He or she can discard a bunch of lands, take damage, sac some tokens, or a mix of the three. They can always choose to lose their board instead of just dying. The end result is that your opponent will make the best choice in which they will lose their least relevant resources while still allowing the game to continue. That said, this card can be game-ending. If you're playing this in a ramp or control deck and are casting this for a large number, there's no way that your opponent will have the appropriate resources. Even if they do, their board will be decimated. We wanted to include Torment of Hailfire as the rare card in the Torment cycle to give players an option as a finisher in control or midrange decks for Limited and potentially Standard. The goal was for this card to not get cast very often—but when it is cast it's incredibly punishing. That's about it for the Torment cycle. Thanks for reading my first Play Design article. This column slot, formerly occupied by Latest Developments, is now home to a new column with a new name. Our team will be using this column to talk about all things Play Design. While the main focus of the column will be talking about behind-the-scenes stuff like how we balance Standard, we're also going to be sharing personal stories about how the team interacts at work. Like you, we're all Magic players, and we want to be more than just names to you guys. 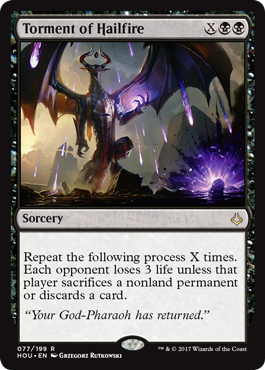 Enjoy the rest of the Hour of Devastation previews, and I'll see you next week!